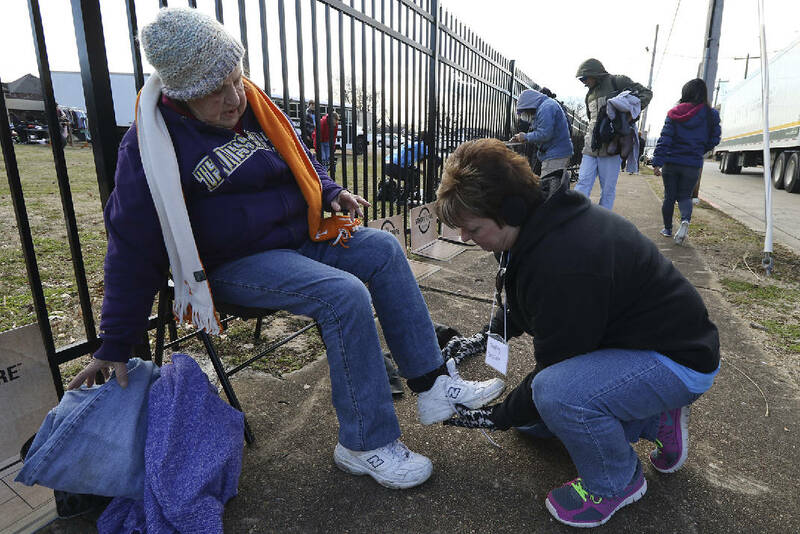 Wanda Rodewald, left, is aided by Tricia Foster in picking out a new pair of shoes during the "Street Store" event run by Southern Adventist University and Salvation Army volunteers offering free clothes and lunches for the homeless as a Martin Luther King Day service project on Monday. With the forecast of snow and temperatures below freezing for the next three nights, the Salvation Army will open its doors for overnight emergency shelter for the homeless at 6 p.m. tonight, Thursday and Friday. The ReCreate Café, The Salvation Army's Day Center located at 800 McCallie Ave., is busy preparing to serve those in need throughout the frigid nights. Volunteers are needed to help serve in the shelter. For volunteer information, email Stacey Crisp, Volunteer Director, at Stacey_Crisp@uss.salvationarmy.org or call 423-505-1052. Monetary donations are also needed for those experiencing the high utility bills that come from having to keep temperatures warmer in their homes. Donations of new heaters or money are being accepted at The Salvation Army, 822 McCallie Ave, Chattanooga, TN 37403. Monetary donations can also be made online by visiting csarmy.org or by calling 1-800-Sal-Army. For additional information, please call 423-756-1023.